The desert-chic trend has been making waves for some time now, and fortunately for our style sensibilities, it doesn't look like it's going anywhere soon. And, honestly, why would it? The sun-bleached textures and airy white accents make for a calming aesthetic, and it works especially well in this bedroom by Ashley Mayes. Wooden furniture anchors the surrounding earth tones, while burnt orange, muted blue, and creamy white create an organic palette of subdued shades. In fact, the true magic comes from the inviting layers of comfortable throws and cozy blankets, which softens the rugged artwork overhead. To keep this look inviting, focus on an array of textures — it will create a rich design without the added clutter. 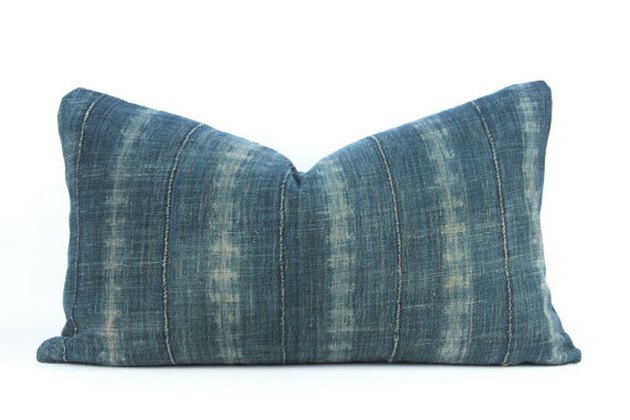 This texturizing pillow is the type of accessory that would be stunning in a similar bedroom.